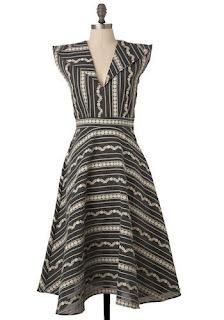 Think wide collar, natural waist, full skirt, sleeveless but not strappy. I had a sort of dumpy wrap dress pattern, Simplicity 3877, so I used it with some modifications. The collar was sort of a trial-and-error, but it ended up working. I took the collar piece and added a curve, see? 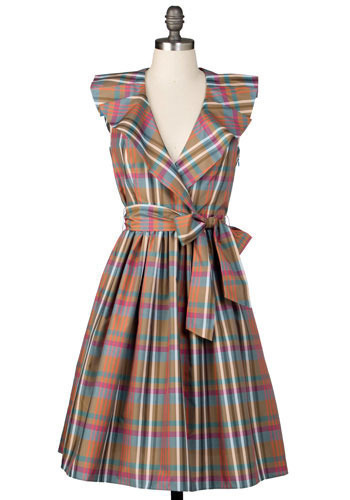 I used the collar as usual, with some of it being on the bias, and added pleats above the bust like the darling plaid frock above. I like your version best! You did a wonderful job, it's beautiful. Such a cute dress!! Okay random question- I'm not great at sewing, and when I'm doing things that need to be measured and cut, I absolutely hate using a tape measure, etc. So I saw on this post under your fabric you have a board underneath with measurements. That is EXACTLY what I want/need :) Could I find this at a fabric store?? And do you use the rotary scissors over regular scissors??? Thanks so much!! That looks fantastic! I wish I had the skills that you have. 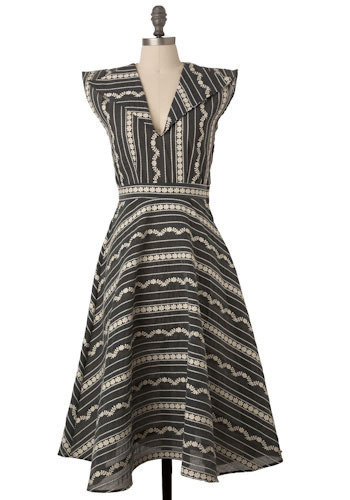 I so want this dress now. Love it---as always. So cute! It's great! I like the color. That's a lovely dress. The colour is gorgeous and you made a beautiful collar. Great job! You have a lovely blog! Inspirational! LOVELY! I can't wait to hone the skills necessary to turn-out fantastic little dresses like this! I think this is my favorite project you've done yet! The front/neckline is gorgeous! You amaze me! I love yours. 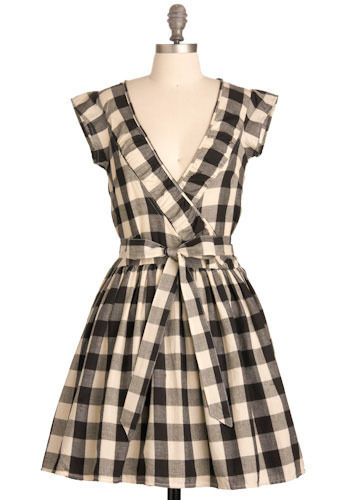 the first dress is darling with almost a fifties style. But, yours is totally cute for always! It's so classy! Pretty! I like your version best, the neckline is so flattering! I had just spotted this http://www.modcloth.com/store/ModCloth/Womens/Liquid+Mercury+Dress the other day--very similar! Beautiful work. I made a dress very similiar to this, but it was made with a silky print and it had two layers of ruffles. It was a very cute wrap dress. It was a more formal version of this.